James Freeman Clarke was born in Hanover, New Hampshire, USA. He was an American theologian, preacher, professor and author. He graduated from Harvard College in 1829, and Harvard Divinity School in 1833. He established in 1841 the Church of the Disciples in Boston, where he was minister from 1841 to 1850 and from 1854 until his death. 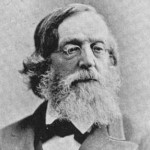 He was secretary of the Unitarian Association and professor of natural religion and Christian doctrine at Harvard from 1867-1871. In addition to sermons, speeches, hymnals, and liturgies, he published 28 books and over 120 pamphlets during his lifetime. He wrote several books include: Orthodoxy: Its Truths and Errors, Ten Great Religions, Essentials and non-essentials in religion, Self-Culture, Every-day religion, Vexed Questions in Theology, Sermons on the Lord's Prayer, and Autobiography, Diary, and Correspondence.